Here's a first look at Nick Fury's flying fortress from Joss Whedon's Avengers. 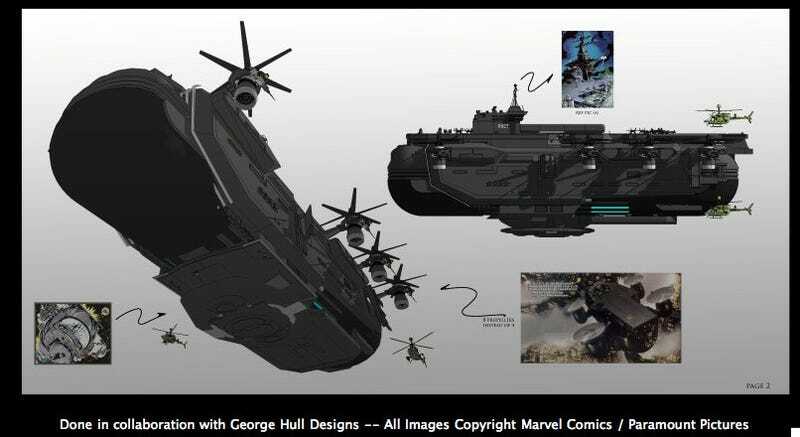 The Helicarrier, which was originally supposed to appear in Iron Man 2, was designed by George Hull and eschews the comic book design's turbines for giant propellers. According to leak site Spidermedia.Ru, Kevin Feige wants to build one of these puppies atop the convention center for the 2011 San Diego Comic-Con. I hope he also decides to recruit 300 Samuel L. Jackson impersonators to wander the convention floor as Life Model Decoys.